I have absolutely no idea where this obscure little book came from. You know how particular books just seem to have lived on your TBR shelf since the Dawn of Time and you have no recollection of actually obtaining them in any way? One day it was residing on that shelf and the next I was trudging through reading it with no memory of the intervening time. My conclusion? This is a MAGIC BOOK. Behind the public facade of any great museum there lies a secret domain: one of unseen galleries, locked doors, priceless specimens and hidden lives. Richard Fortey, former senior palaeontologist at London’s Natural History Museum, here celebrates its pioneering work – delving into the scandals and skulduggery that unfolded alongside extraordinary scientific endeavour. This is a fascinating, affectionate account of a world of hidden treasures by a scientist who combines rigorous professional learning with a gift for prose that sparkles with wit and intellect. I do think the blurb above is a little misleading – it implies that the book is more a social account of the instution when it’s definitely a scientific one. It’s much more about the biological advances that have been made by those working at the museum, than an account of the institution itself. I’m not sure whether it’s my own fault for misunderstanding the summary, but it really did bore me. I’m not a scientific person; I never have been. My A-levels consisted solely of humanities and languages and during the GCSE years, my best friend and I had an arrangement where she did my Science homework in exchange for my completion of her English and German. I’m just not interested and if I’d known what Dry Store Room No. 1 was actually about, I don’t think I’d have bothered. Chapters 3 to 7 are almost purely scientific detail, complete with Latin names, scientific techniques I’d never heard of and detailed descriptions of expeditions undertaken. I did enjoy the parts that were relevant to the museum itself. Mr. Fortey can write very well when he’s not lecturing about fossils, and while it’s not exactly hysterical, it is interesting. I didn’t know that the museum used to have a ‘Whale Room’ where pretty much all of the beached wales in the country used to end up for dissection, and I liked the descriptions of life at the museum during the war. I just wish it could have been more of the same instead of a whole chapter on various rocks discovered by museum staff. 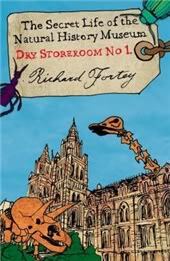 The best word I can come up with to describe Dry Store Room No.1 is ‘stuffy.’ The author is a retired paleontologist who came to the museum in the 1970s to study trilobites and who clearly misses the days when the tourists were a secondary concern in favour of the dead stuff behind the scenes. He claims that his primary wish is for the book to inform others of the importance of museums, and in that respect, he’s successful. I had no idea how much the museums of the world had contributed to scientific advancement, both financially and intellectually. That’s a genuine Facebook status, by the way. It’s probably a slight over-reaction but I just could not get through it and I was dying to read something (anything!) else. I really wanted to like it, and it’s not even Mr. Fortey’s fault that I didn’t; it was just a different book than expected. I’d still recommend reading it, I think. Just don’t let the cartoony cover fool you – this is a book about science.